The all-new, redesigned 2016 Hyundai Tucson in Arlington has arrived as an athletic crossover ready to take on the road ahead. 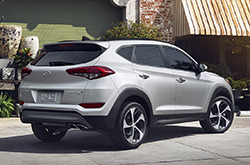 Now sportier, safer and more efficient, the Tucson is a fresh option for Dallas-area buyers seeking a contemporary CUV wrapped in a stylish frame. Check out our full 2016 Hyundai Tucson review below to learn more about the specific features and extra amenities that have helped make this redesigned crossover an exceptional choice. This year's Tucson is revised from the inside out. Now more spacious and advanced, the interior is marked by top-notch available technologies, innovative stain- and odor-resistant cloth seats and 31 cubic feet of cargo room (5 ft3 more than last year's model). Standard features include a 5-inch color touchscreen audio system, remote keyless entry, automatic headlight control and a 60/40 split-folding 2nd row while buyers can also opt to include the Blue Link Telematics system, leather seats, 8-inch touchscreen navigation and a panoramic sunroof. Plus, the Tucson was built for security thanks to a standard driver's blind spot mirror and an incredible suite of available safety features that include lane departure warning, blind spot detection and rear parking sensors. On the outside, the Tucson is redefined with a bold style highlighted by sleek accents and creases. In addition, the wheelbase has been stretched by more than an inch to create extra capacity while the hexagonal-shaped grille, 17-inch alloy wheels and available LED twin-projector headlights will turn heads as you round every curve. Another aspect our 2016 Hyundai Tucson review thinks you'll love: the efficiency. 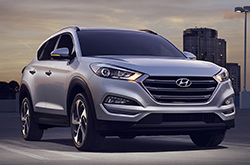 Estimated at a combined 26-mpg fuel rating, the base Tucson utilizes a 2.0L Nu engine rated at 164 hp. Buyers of the Eco, Sport and Limited trims can also select a high-performing 1.6L Gamma engine that offers 175 horsepower along with a combined fuel rating of 27 mpg (29 for Eco model). This efficiency doesn't come at the cost of utility though as 4WD is optional and driver mode selector comes standard. 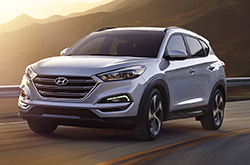 Redesigned with the customers in mind, the 2016 Hyundai Tucson in Arlington is an elite crossover built for success. Whether you're carrying precious cargo to practice or extra equipment for a weekend out, you'll be blown away by this unrivaled CUV. We're confident that the Tucson is perfectly built for you. 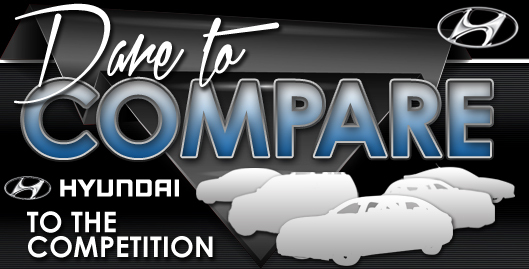 That's why we offer tools that will allow you to compare Hyundai's latest model against the 2016 Nissan Rogue, Honda CR-V, Chevrolet Equinox and the Toyota RAV4. With modern features and an marvelous design, shoppers will love the Tucson. For Arlington Hyundai customers who want a remarkable value, just compare this vehicle's price to the opposition and you'll see that it's a solid investment. Take a peek at our bullets for more useful facts! Does the Tucson have what you want out of a vehicle? Check out Vandergriff Hyunadi's overview above, as well as other 2016 Hyundai reviews to find the best model for your traveling needs. It's our obligation to serve reviews composed by the most accomplished automotive writers in the business - it's just one of the things that makes us a top-rated Arlington area Hyundai franchise. Packed with credible information and specs, each paragraph gives you complete details about all the Tucson has to offer Arlington drivers in terms of fuel economy and much more. After checking out Vandergriff Hyunadi's review of the new Tucson, message us to schedule a test drive and find out about finance offers!